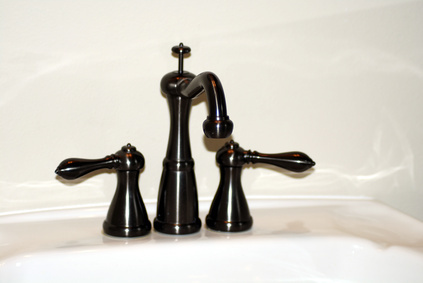 Fixtures are simple updates for any bathroom. Whether you are simply tired of your bathroom's current décor or you haven't had an update in years, there are many simple and affordable ideas to transform your space into a welcoming area of the home. If you want an easy weekend project, painting or adding decorative touches to the bathroom can improve the look of the room. If you have more in your budget, changing amenities, flooring or lighting offers a total overall to any bathroom. Updating the flooring is a sure way to increase the value of the home. If you have linoleum, opt for tile or waterproof wood. Tile comes in many materials such as ceramic, marble, granite or earthy travertine. Since bathrooms are usually smaller than most rooms in the house, updating the floor with tile is a major improvement that does not require you to use the entire budget. Wood flooring is a sleek and stylish décor idea, but should be waterproofed to prevent swelling or possible water stains. Lighting is a major factor in bathroom décor because not only does it provide ample lighting to bathe or get ready, but certain lighting may not be as useful in the bathroom. Recessed lighting is ideal for smaller rooms because it does not take up much space, but the limited lighting may cause overhead shadowing when looking into the mirror. Skylights are economical sources of natural light, and with the addition of wall sconces, the flood of light makes any room appear larger. You may choose light fixtures to go with any style décor you have, including brass or iron for more romantic or rustic bathrooms and stainless steel or nickel-plated fixtures for a modern feel. One of the easiest and most affordable decorating ideas for any bathroom is to paint the walls for an updated and fresh look. If you have a small bathroom, selecting paint shades in lighter tones such as cream or yellow opens up the space even if there is minimal lighting. For a bold look, choose shades such as red, purple, green or blue for a pop of color. If you want a relaxing bathroom, tranquil shades of grey, sage or lavender offer a soothing ambience to the room. Before you begin to paint, be sure that shades complement any existing wood or tile materials.